With 340 days of sunshine a year, mountains for skiing located a short drive from the warm Mediterranean, Greek culture, British-influenced laws and low taxes, Cyprus is enjoying its new status as a premier second-home destination. Surrounded by Mediterranean Blue Flag beaches, at Cyprus’s center are the Troodos Mountains studded with pine and cypress forests and late-Byzantine churches, hilltop monasteries and sleepy wine-making villages. Draws include “the weather, food, western culture and the fact that everyone speaks amazing English,” said Alexandros Moulas, director of International Development Consultancy at Savills. One key to the country’s revival as a second-home location is its so-called Golden Visa program, which offers those who invest at least €2 million (US$2.4 million) in property E.U. citizenship, which means the right to live, work, study and invest in all E.U. member countries. The threshold to get a visa was reduced two years ago from €2.5 million (US$3.03 million) to attract more buyers. In 2013, Cyprus’s financial crisis wiped €4.5 billion of the value of its banks. But five years later, and thanks in large part to the Golden Visa program, the country has made a remarkable recovery to attract growing numbers of ultra-high-net worth, international second-home buyers to its glut of soon-to-be-completed exclusive resorts. In fact, according to Alexandros Moulas, director of Savills International development consultancy, 503 passports were issued in 2017, up from 443 in 2016. Transactions on property worth more than €1.5 million (US$1.8 million) increased year over year by 45% in 2017, according to the Cyprus real estate market report by auditors PricewaterhouseCoopers. Of these, 52% were in Limassol, on the south coast, Cyprus’s second largest city and the main international business hub. The city is home to hundreds of international companies attracted to one of the lowest corporation tax rates in Europe. The majority of luxury properties in Limassol are apartments, with 66% of high-end residential property transactions in Limassol in 2017 related to apartments and 34% to villas, the PwC report found. The government’s decision in 2015 to allow high-rise building has resulted in an explosion of luxury developments. Mr. Moulas said there are 10 mega projects underway, all but one of which are in Limassol. In Limassol, property can sell for up to five times more than in other Cyprus markets, Mr. Moulas said, and is almost always significantly more expensive. On average you can expect to pay up to €5,500 to €6,500 (US$6,659 to US$7,870) per square meter in prime coastal locations such as Ayia Napa Marina but up to €10,000 to €12,000 (US$12,108 to US$14,530) and above per square meter in Limassol. 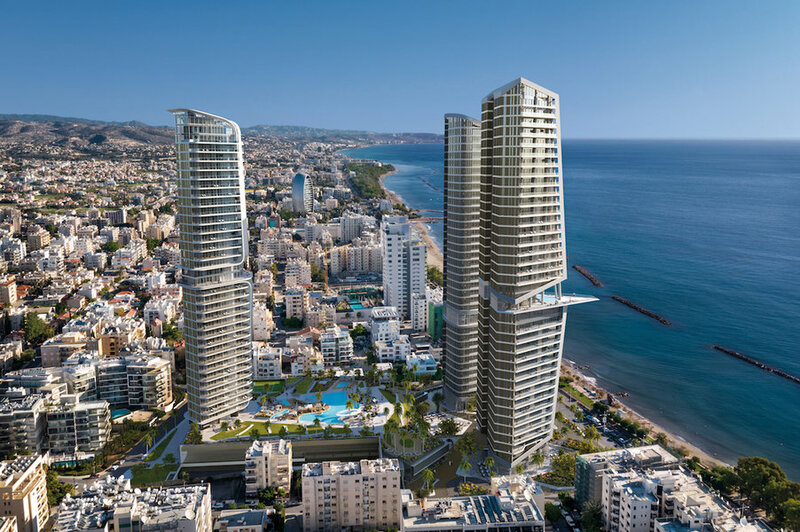 The most expensive property sold in Cyprus was the penthouse at the ONE Limassol development, which sold for €24 million in early 2017. Prices for the apartments at new project Trilogy Limassol Seafront start at €750,000 (US$908,111) and go up to €8.5 million (US$10.3 million). The development of three sea-facing towers will combine homes and offices with private facilities, such as a double-height spa and gym in each tower, indoor and outdoor swimming pools, landscaped gardens, children’s play area and tennis court, with a public plaza at the front of the development with dining and shopping facilities. Limassol Del Mar, meanwhile, stretches across 170 meters of Limassol’s sea frontage, bringing a new shopping mall, restaurants and bars along with a gated luxury community with spa, gym, indoor and outdoor pools and clubhouse. The property should be completed in the summer of 2019. Cyprus has always had a high proportion of foreign residents and been popular with British people, as it used to be a British colony. But in recent years it is non-E.U. buyers—particularly Russians, Chinese, Asians and Middle Easterners— who have shown interest in Limassol due to the citizenship program, according to Mr. Moulas. It is also a popular base for expats who work in the Middle East but prefer to settle their family somewhere that feels more European. At Limassol Marina, for example, apartments and villas were sold to over 30 nationalities, including buyers from China, Japan and South Africa, said Michalis Hadjipanayiotou, CEO of one of Cyprus’s largest luxury developers, Cybarco Development.